A lot of PC building enthusiasts have been holding on to their Ivy Bridge and Haswell builds waiting for a worthwhile multi-generational change. 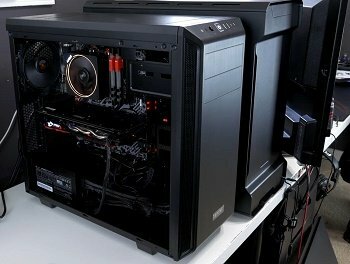 Now that AMD’s Ryzen and Coffee Lake are out, we think it’s a good time to upgrade those old computers. Here’s a look at 4 PC builds from $1,250 to $1,500. We’ll give you a list of the parts and then tell you why we decided to go with the hardware we did. When I compare these builds to what I was suggesting last year, in 2018 we’re placing a bigger priority on the CPU. This comes as a result of testing various games where 4 core processors simply don’t make the cut. That being said, the type of processor you need has to do with more than just that. Your graphics card, resolution, and even the games you play should all be considered. Still, I feel that putting a little extra towards your CPU will allow this build to have additional longevity. Before I get into why we chose the parts we did, here’s a table with a summary of the parts we’ve used. If you’d like to know more, see our more detailed explanation below. If all you want to see is our current PC builds, you can take a look at all of our top builds by budget here. Keep in mind with this list that these prices reflect MSRP. GPU pricing may vary depending on when you build your PC. For more information on whether you should go with the Ryzen 7 or the i7, take a look at our recent benchmarks. If your aim is gaming alone, the i7 still wins this race. 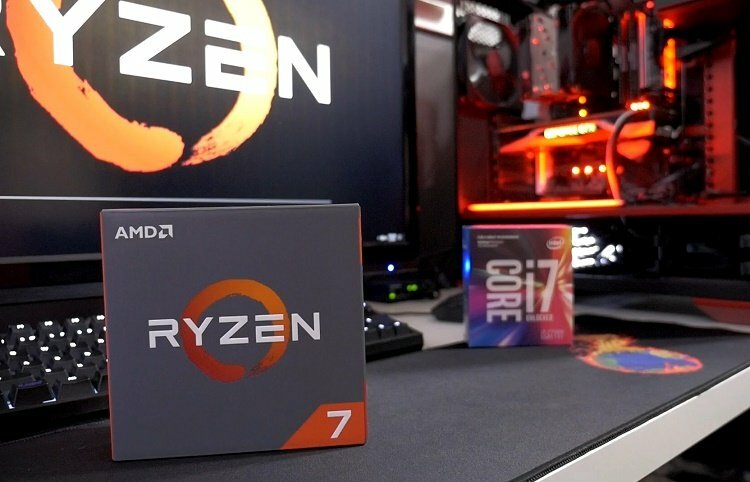 As you see in the table above, we’re recommending either the Ryzen 7 1700 or the Intel i7-8700(k) at this price point. The Ryzen 7 1700 comes in at just under $300, Ryzen 7 1800X at $350, i7-8700 at $330 and the unlocked i7-8700k at around $375. If you’re simply looking for gaming performance, the Intel i7-8700(k) wins here hands down. You can take a look at our AMD R7 1700 vs Intel i7 benchmarks here for more information. Even the previous generation Skylake processor won that showdown. That being said, there’s a lot to like about an 8 core and 16 thread processor in the AMD Ryzen 7 1700 or even the 1800x. The platform and motherboards available for it are generally less expensive and you get 2 more cores and 4 more threads vs the i7-8700. This makes it a good workstation CPU overall; however, not better than the i7. Overall, we like the i7-8700. It’s not too far off in price and wins soundly in most benchmarks. For benchmarks, we recommend the video below which compares the Ryzen 7 1800X to the i7-8700k and i5-8400. If you’re going with the Ryzen 7, we do like the 1700 over the 1800x as you can get similar performance with an overclock. Perhaps the bigger question here, if you’re a gamer, is if the Ryzen 5 1600 represents “good enough” at a price point $130 to $175 lower. For you, if that means a better graphics card, it might be worth going that direction. 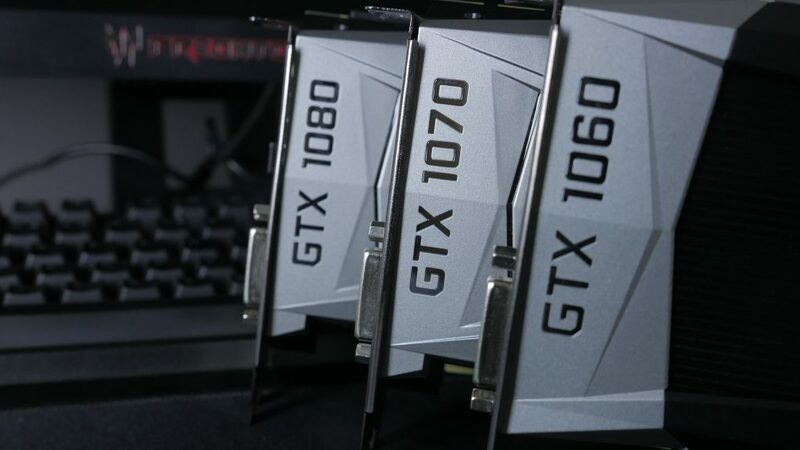 We recently did a comparison of the reference 1080, 1070, and 1060. What’s right for you depends on the types of games you play and the resolution and settings you play them in. If you want a more bare-bones version of each of these PC builds, money can be saved by going with 8GB of memory, a smaller solid state drive, a less efficient power supply, and a motherboard with fewer features. In fact, there’s nothing wrong with that. So, if you’re trying to fit a GTX 1080 into the $1,500 build and a GTX 1070 Ti into the $1,500 we totally get it. However, we feel that these builds are a better fit for the mainstream consumer who prefers to upgrade their GPU every few years. For our $1,250 builds we’ve *recommended the GTX 1070 and for the $1,500 build, the GTX 1080. Clearly, the 1080Ti is the king right now. So, if your aim is 30% more performance in 4k, it’s probably a good idea to go that route. There isn’t an AMD option we’d recommend for either one of these builds right now. Down the road when VEGA is released, that’s a possibility. For now, we recommend you stay with team green at this price point. *Update: We lowered this to the GTX 1060 6GB and GTX 1070 due to current pricing. In terms of benchmarks, we’ve got a few for you to look at. Here are few we’ve done for the 1080Ti and the 1080 in ultrawide. For a good comparison of the GTX 1080 and the 1070, we’ve done some benchmarks as well. If you’re looking for a benchmark for a particular game, that’s a good place to start. That being said, the $500 price of the GTX 1080 is very appealing for those of you looking to game in 1440p on ultra settings. Those of you who are willing to go with high settings or simply want to game in 1080p, should save some money and stick with the GTX 1070 for now. Very few gamers ever end up actually overclocking their CPUs. I’m sure a lot of people, as they’re building their CPUs, think, “hey I’m going to overclock this CPU to 5GHZ”. In reality, this rarely happens. So, if you’re not planning on overclocking, there’s a couple of things to know. First of all, a CPU like the i7-7700 can save you some money. Also, the Ryzen 7 1700 isn’t nearly as good of a performer without being overclocked and isn’t nearly as good of a deal if you keep it at stock settings. For this reason, the i7 is likely the solution for the majority of people right now. Second, not overclocking here can save you $30 on your CPU and another $30 to $70 on the Cooler. This could be enough to go from the 1070 to the 1080. This will give you better performance in games. If you do plan on overclocking, the Noctua NH-D15 is one of the better air CPU coolers out there. It should allow you to get a solid 3.9 to 4GHz overclock on your Ryzen CPU and 5GHz without a problem on the i7-7700k. Of course, if you just want to do a light overclock, you can save some money and go with the Hyper 212 EVO. 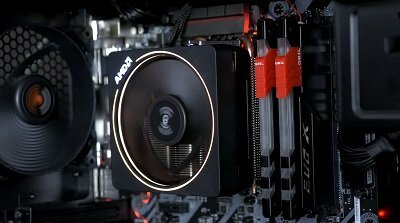 If you do go with the Hyper 212 EVO, there’s a free Ryzen compatible mounting bracket on the Cooler master website. For those who are wondering, the Ryzen 7 1700 does come with the wraith CPU cooler. It should, depending on your CPU, allow you to do a decent overclock as well without spending any extra on a CPU cooler. For the motherboard, we’re going with a mid-range option here for both builds in the MSI X370 Gaming Pro Carbon and Asus Z370-A Prime. These have plenty of features for most builders. Of course, the B350 Ryzen chipset does allow overclocking. So if you just need some more basic features, you might be able to save some money here by going with a good AM4 B350 motherboard. The same can be said about the Prime here. Going with a budget Z270 option around $100 will save you around $50. If you’re wanting more information on what motherboard to choose, we’ve listed our top Z230 Kaby Lake motherboards here. Also, here’s a look at our recommended top AMD AM4 X370 motherboards. Our $1,500 build is using a good nVME SSD drive to speed up boot times and loading screens. Of course, you could use the Sandisk drive we’re using in our $1,250 build here to save some money. Loading times will still be pretty fast. However, for the price of these nVME drives it’s hard not to pull the trigger. It keeps your build current and fast and that’s something we all want. Ryzen loves fast memory. However, there are certain kits that simply work better on it. We’ve written about that in our post on the best Ram for Ryzen. So, if you’re wondering why we’re recommending two different kits for the Ryzen and Intel builds, that’s the reason. On the Intel side, you typically get at least what a manufacturer lists as the speed. So, something like the inexpensive Corsair Vengeance LPX memory here is ideal. The Corsair 200R is one of the most popular cases right now. It’s a no-frills option that looks good in just about any setting. You can order it with or without the window and the inside features a tool-free design with plenty of cooling options. If it’s not robust enough for you, feel free to go with one of these good case options. Overall, these are the computers I’d build at this price range as of right now. While the options may change for some, in my opinion, this build gives you the best overall value for your money. Questions, comments and feedback are appreciated here as well as on our facebook page. You can see more builds like this one here as well as on YouTube. Hi, really helpfull article you’ve done, thanks! i have a question about video cards, you said “PCIe 3.0 support also seems to play a big factor”, if i conect it to a PCIe2.0 how drastically does the performance of the video card decrease?